The steampunk phenomenon takes the best of Verne and Wells style science fiction and mixes in a sense of magic among the technology. The costumes feature Victorian-elegance and detailing, the art forms often carry a touch of the grotesque, and the story possibilities are boundless. In literature, Viola Carr‘s The Diabolical Miss Hyde stands out as an easy-to-read murder mystery that has the protagonist moving through theaters, jails, magic undergrounds, and insane asylums. Dr. Eliza Jekyll serves as a forensic scientist in a culture that easily dismisses women. Like her famous father, she battles an internal foe, Lizzie Hyde. The extra personality resembles a drug addiction, which Eliza must fight while assisting her police friend solve homicides in gritty London without interference from the government sponsored Royal Society. In terms of voice, Ms. Carr excelled in this novel. Though much of the story comes from Eliza’s viewpoint in third person, the real narrator of the story is Lizzie Hyde who uses first person perspective. Where this change might sound confusing, it actually strongly delineates the two women in a clear and immediate way for the reader. Her steampunk world was engaging as well. The Royal Society, led by a mysterious arbitrator of science purity, keeps an iron-clad control on scientific discoveries, burning those individuals who go against ancient principles or smack of magic. As a result, scientific investigations have become stunted while the fairies and other magical creatures have gone to the slums and dark alleys as well as underground in caverns. In some ways, Lizzie fits better in this dark slum world than Eliza does in her scientific one. The story divides between Jekyll’s ongoing fight to control her own demons, and the investigation of a crime that features the mutilation of beautiful women and the collection of body parts. Along the way, Ms. Carr incorporates vague references to literary greats other than the creator of the Jekyll and Hyde classic, Robert Louis Stevenson. Side mentions include a reference to Tesla’s work, a vampire in the asylum, Dr. Frankenstein’s experiments, and the legend of the werewolf. The ending, like many books, sets up the two main characters to continue into a series. In fact, two more have come out in the last two years. Whereas Ms. Carr hints at a developing relationship between Eliza/Lizzie and the Royal Society Enforcer, Remy Lafayette, it never devolves into saccharine sacrifice of her giving up her career or position to the man. Such plot twists are common in Victorian literature but irritating to 21st century women. The Diabolical Miss Hyde remains at its heart a feminist novel as well as a mystery, making it more enjoyable to modern audiences. I highly recommend this mystery, particularly if you love steampunk and/or a new look at old stories. Unlike some others in this genre, Ms. Carr doesn’t bury the story in overdone romance or difficult Victorian writing styles. This makes the book easier to read and allows the audience to focus on the mystery rather than the art of the genre. 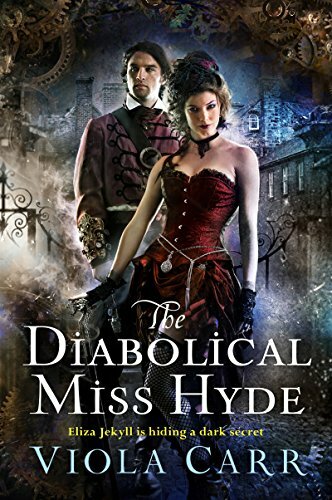 The Diabolical Miss Hyde was published in 2015 by Harper Voyager.